What’s the point of continuing otherwise? If you don’t love it, leave it alone. While this is very good advice, it is also easier said than done. However at some point the quality of your work will be affected by the amount of love you have for the field you are in. That said, we are humans, at times we need to take a second to recharge our batteries in order to reaffirm our love for the things we do. Honestly, if nobody read this blog (I would be hurt but) I would still write because I am talking about my passion. Like I mentioned in “The Passion Of The Designer”, the reason why my business hasn’t gone under yet is because of the amount of passion and love I have for it. “Every day I wake up, I am excited to go to work! This is what keeps me going, what drives me. I love it so much even the learning process is fun [I swear I’m not a nerd……]”. Ok. How do I know that I love what I do? How will you know if you love what you do? That’s easy, I completed a ten point bullet list of why I love designing. You can take it and apply it to your current job to see if you actually love what you’re doing or if your sanity depends on you leaving that job you are in to pursue other objectives in the future. I look forward to going to work each day. I feel happy thinking about designing. I get excited when telling friends and family about the work I do. I engage complete strangers in design related conversations. When I’m not working I feel as if something is missing. I actually spend hours reading about design related documents. I forget to take breaks when I’m working. I would continue designing even if I wasn’t getting paid to do it. (Yes, I’m serious). Oddly enough, a day at work isn’t draining for me. If you find yourself going “Hey, me too!” to all the items on the preceding list, then my friend you are a nerd. Oh wait, wrong post, I meant to say you are indeed happy in your current job (which I hope is a good thing). 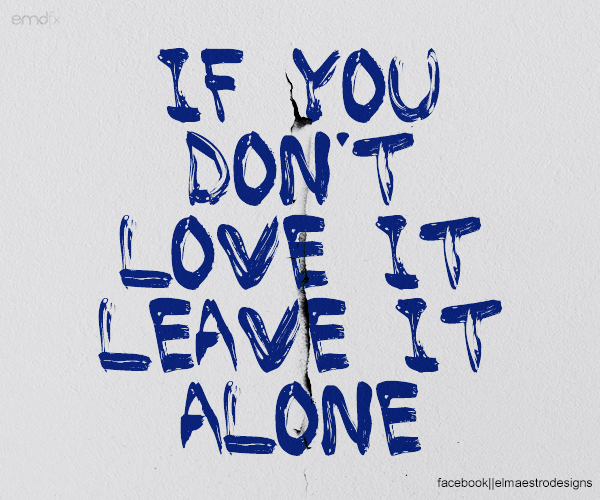 But if you don’t love it, then there is only one thing to do….leave it, just be wise about it.